Thanks to Paco Peralta,* I received a review copy of the new book from Museu Tèxtil i d’Indumentària de Barcelona, Pedro Rodríguez: Catalogue of Maria Brillas’s Dresses. The museum’s collection of Pedro Rodríguez’ work was recently expanded when it acquired the wardrobe of Maria Brillas (1905-1992), a Barcelona society lady who dressed exclusively in Rodríguez for much of her life. Brillas’ extensive wardrobe—over 300 pieces, from the 1920s to the 1970s—covers most of Rodríguez’ career, and in 2011 the collection was the subject of a major exhibition, ¿Qué me pongo? El guardarropa de Maria Brillas por Pedro Rodríguez (What to Wear? Maria Brillas’ wardrobe by Pedro Rodríguez). The book concludes the museum’s project of cataloguing the new collection. Vogue patterns by Rodríguez. Images: VADS, Vintage Patterns Wiki. Three short essays accompany the catalogue. Fashion historian Sílvia Rosés’ contribution, “Pedro Rodríguez: the Birth of a Fashion House and the Evolution of a Style,” gives readers an overview of Rodríguez’ 60-year career, with special attention to collections presented during the golden age of couture. Museum preservationist Sílvia Ventosa’s essay, “From the Wardrobe to the Museum: The Dresses of Maria Brillas in the Museu Tèxtil i d’Indumentària de Barcelona,” recounts the story of Brillas’ donation to the museum and its efforts in transferring her private wardrobe to a public, institutional context. In “The Role of the Client in the Creation and Popularizing of New Trends,” Miren Arzalluz, who curated the 2011 exhibition, offers an intriguing perspective on the couturier-client relationship. Noting the long friendship between Maria Brillas and Pedro Rodríguez and the designer’s published observations on his clients’ role in the design process, she argues that “the relationship between designer and client was far richer, more complex and more fruitful than many people were willing to recognize” (67). Maria Brillas and Joachim Ensesa, 1950s. Image: Forum Para a Moda. Rodríguez day dresses. 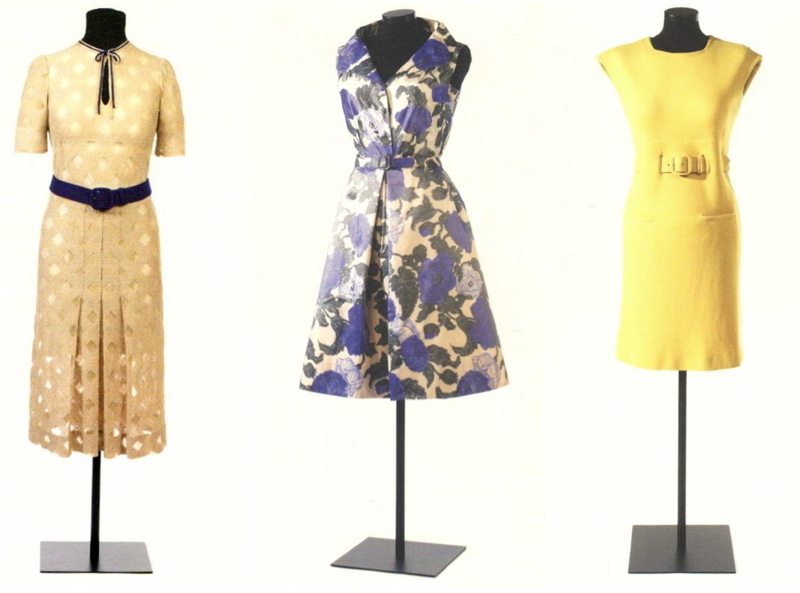 Left: cotton tulle with cotton embroidery, 1935; centre: printed silk taffeta, 1959; right: double wool knit, 1965. 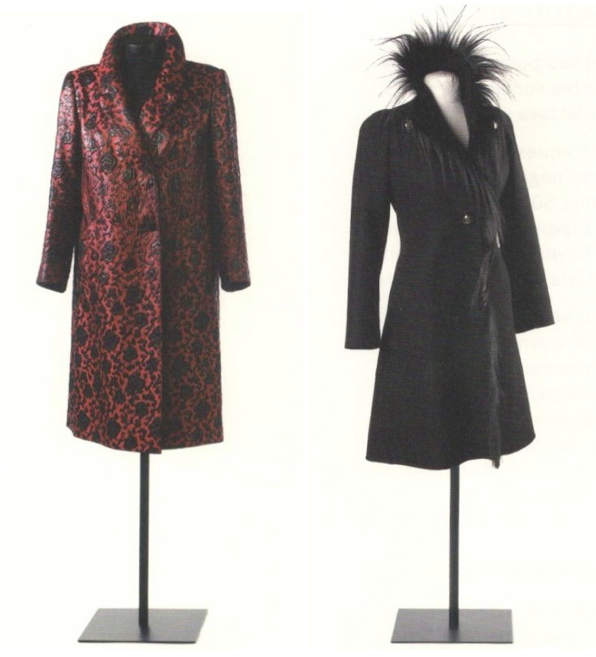 Rodríguez coats; left: double-faced wool with dyed fox fur collar, 1972; right: silk satin, 1957. Rodríguez coats. 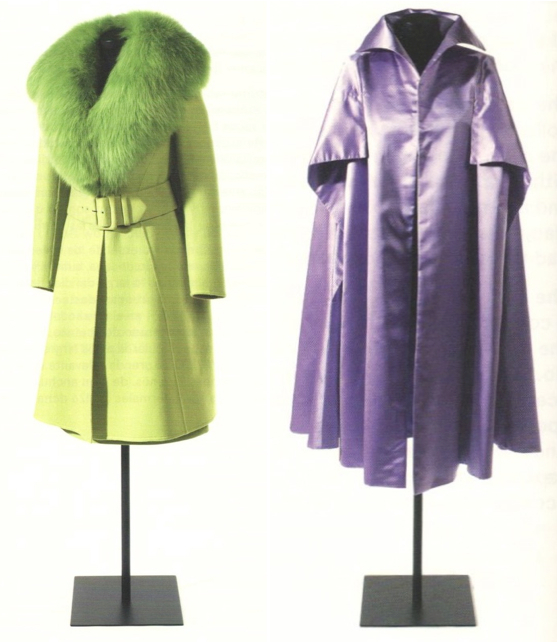 Left: raincoat in waxed acetate cloqué, 1965. Right: coat in double-faced wool with monkey-hair trim, 1974. 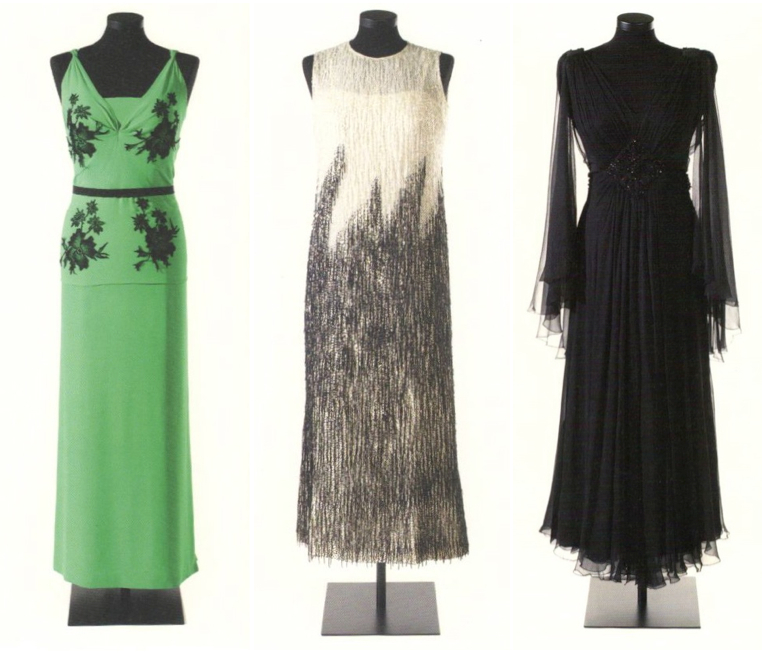 Rodríguez evening gowns. Left: silk crêpe georgette with silk lace appliqués, 1940-50; centre: silk gauze embroidered with glass and jet bugle beads, 1972-73; right: silk muslin embroidered with jet, 1973. 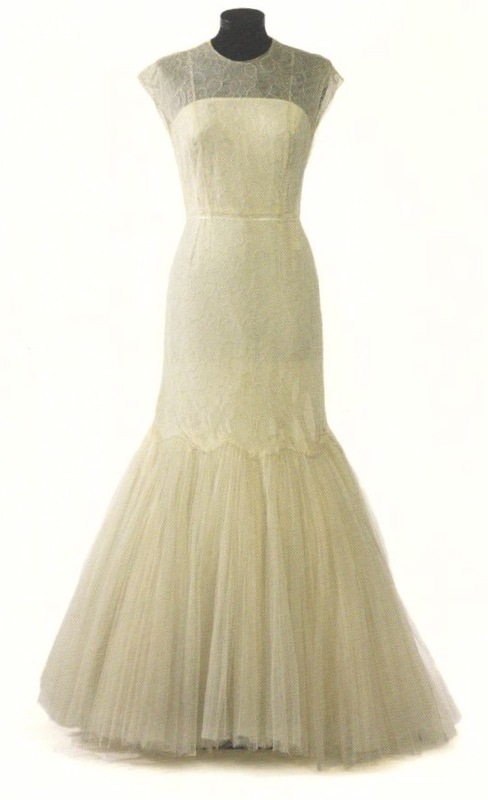 Rodríguez mermaid dress in tulle and pleated cotton lace, ca. 1950. Two sections are devoted to accessories, one for hats and the other for shoes, gloves, and bags. The hats are the earliest pieces in the catalogue, with many from the 1920s and 1930s. Some hats were produced at Rodríguez’ studio, while others were commissioned by him from prominent milliners. Brillas’ shoes were made to match her dresses. Rodríguez cocktail dress with accessories. 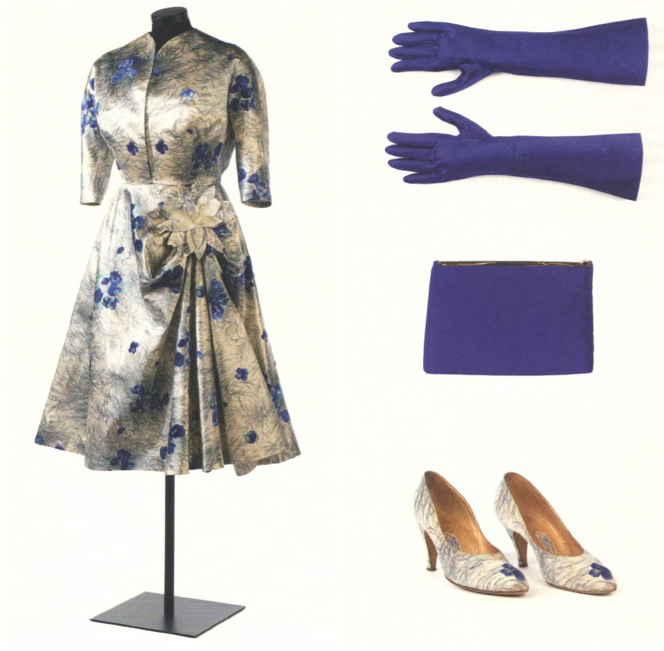 Dress: printed silk satin with rayon tufts; silk satin handbag and gloves; Bonet court shoes; all 1955-56. Rodríguez fancy dress hat and mask. 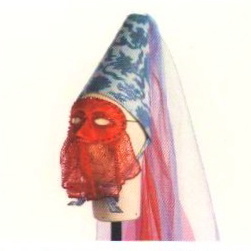 Hat: nylon tulle with fil coupe brocade; mask: rayon satin with rhinestones, 1968-70. It’s a beautifully produced volume, with high-quality photos presented in a reader-friendly smaller format. (You can see more photos at the website of Folch Studio, the design firm behind the book.) My only quibble is with the English text (I don’t read Spanish or Catalan), which contains infelicities that seem to be an effect of translation. This book is a valuable addition to English-language resources on Rodríguez, and will assist in further study of the designer and his place in the history of haute couture. * Paco was a member of the collection’s monitoring committee; you can read his post on the exhibition here. Rossend Casanova (ed. ), Pedro Rodríguez: Catàleg dels vestits de Maria Brillas / Catálogo de los vestidos de Maria Brillas / Catalogue of Maria Brillas’s Dresses, Barcelona: Museu Tèxtil i d’Indumentària de Barcelona, 2012. Text in Catalan, Spanish, and English. Available online from Laie, Barcelona. Oh wow! That was such an interesting post. Her wardrobe is beautiful. Absolutely stunning elegance! I would love to have matching shoes! Thank you! I love the post Sarah. Rodriguez is unknown and it is good to remember his work and his designs. Thank you very much. Wow. That looks like an amazing book can’t wait to see it. Thanks for the review! Thank you for your post about Pedro Rodriguez. I had not heard of him until now. I ordered the book and just received it. What inspiration; amazing work. Sandra, I’m so glad to hear you were inspired to order the book! It’s a pleasure to be able to introduce Rodríguez to a new audience. Thank you so much for your post. I have been trying to find photos of Rodriguez’s work online for a little over a year now, but even in Spanish I was not able to find much. My grandmother worked as a model for Rodriguez in Madrid in the late 40s and the early 50s. She gave me a few photos from those years, but I am really looking forward to reading the book and learning more about his design. Thanks again! My pleasure, Sarah. How fascinating about your grandmother’s modelling work! I’m sure you’ll enjoy the book.